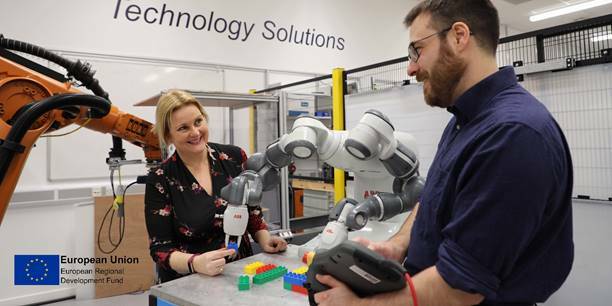 Small and medium-sized firms thinking of incorporating robotics and smart automation in their business have the opportunity to try out their ideas under a £1m scheme launched by UWE Bristol. The SABRE Programme, which is based at the Bristol Robotics Laboratory (BRL) on UWE’s Frenchay Campus, will link businesses with most appropriate robotic equipment for their organisation, enabling them to trial, adopt and develop new techniques. The programme is suitable for any type of small or medium-sized enterprises (SMEs) – from start-ups and sole traders to more established companies. They can either attend free workshops or apply to receive free or subsidised technical support. BRL director Prof Chris Melhuish said: “We are very excited about the opportunities this new initiative presents for BRL to support a diverse range of innovative businesses. SABRE will harness a range of cutting-edge technical equipment and leading engineering expertise in the BRL’s RIFBristol innovation facility, which has a successful track-record of delivering industrial research and consultancy projects since it opened in 2013. RIFBristol director and associate professor for knowledge exchange in manufacturing Farid Dailami said: “SABRE will work with SMEs from across Bristol, Bath & North East Somerset, North Somerset and South Gloucestershire – providing them with hands-on assistance, tailored to their individual research and development challenges. For SMEs researching and innovating new products or services, SABRE’s technical development projects (TDPs) offer more in-depth support, facilitating collaborations with talented engineers and helping them to develop, prototype, test and validate concepts. Farid Dailami added: “Our TDPs are awarded on a competitive basis, following the submission of applications that are reviewed by an assessment panel. “They can have durations ranging from five days to 12 weeks and are tailored to the particular needs of individual businesses. The Sabre Programme recognises the essential role that robotics and automation are already playing in the UK’s innovation landscape as they become increasing important to SMEs in sectors not traditionally associated with industrial hardware. UWE vice-chancellor Prof Steve West said the adoption of these technologies was key for future economic growth. Early indications suggest entrepreneurs from a wide variety of fields – in particular the creative and digital industries – are interested in engaging with the SABRE initiative to use robotics in innovative ways.